Would You Prefer a Beverage Center or a Wine Fridge? Beverage Center or Wine Fridge? Would you prefer a beverage center, or a wine fridge? This is for the kitchen at the 10th flip, and I’m asking because I need to get appliance specs to our cabinet guy. I’m leaning towards beverage center because it seems more versatile, but maybe a wine fridge seems more high end? The price is the same . . .
Could the bev center turn into a wine cooler? Like with different racks or temps? Personally I’d need neither – maybe extra cabinets, or a hidden trash can/pet food area/bookcase maybe? If I had to choose I’d pick mini fridge/bef center. I would never use a wine fridge, but I do see how it could appeal to a higher-end buyer.. I would prefer a beverage center. Or in truth, more cabinet space. Beverage center. I personally hate the old wet bars in so many of the homes when we looked. I really don’t see a need for the wine fridge. You can use the bev. center for that if really needed. I feel the beverage center is more appealing to most. It would be a great spot for easy access drinks and snacks for kids. You could actually turn away someone who loves the home but says “great, why did they put in a wine cooler?” that they then have to get rid of. I think adding those kind of items should be left to the owner. And as far as “high end” I think if it were really high end home shopping they would be looking for a wine cellar. I probably would not use either. Have you considered a trash compactor instead? My brother just replaced a wine fridge with one that was the exact same size. For me, the compactors have a lot more utility. Definetly beverage center you can use it anyway then. I love having our fridge for all our sparkling water. Beverage center. While neither are very important to me, the beverage center seems much more versatile–extra refrigeration for holidays and parties. I love our SubZ two-drawer refrigerator unit. Top drawer is great for veggies and bottom drawer perfect for platters. Great for parties. Also can purchase as a freezer unit which would also be wonderful. Best add-on in our kitchen! We have a wine fridge and I use it for both, we chill chardonnay and sparkling wines or mineral water with our sodas and beer inside too, I think it’s more versatile and not just for wine! We have a wine fridge and use it for both everything that comes in a bottle. There is usually wine, liquor, Coke in a glass bottle, water and beer in there. I think it will depend entirely on how you decide to stage it. Plus a wine fridge looks higher end, I think. Yikes, I think that’s such a specific thing, many people won’t be wine drinkers or have use for a beverage cooler either (we’re annoying natural types who only drink water). It’d be a turn off for me if I saw one in a house, I’d have to figure out how to rip it out and have the cabinetry matched. I’d much rather have more cabinet space. We just installed a dual temp half beverage half wine fridge in our kitchen. We got it at Menards, but saw it at Home Depot also. It’s awesome! I think the wine cooler looks more high-end, but it sounds like the beverage center is more practical and desired, so perhaps it depends on whether you imagine your buyer to be aspirational. Maybe you could buy two, save one for another project, and swap a couple of shelves so you get the look and still the versatility? Definitely beverage center. You can use it for wine and also for other types of bottles and cans. 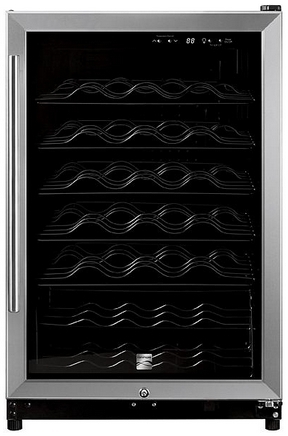 Wine fridges have often racks that don’t accommodate cans or different size bottles. We have a beverage center and it’s been great. Also it’s immediately visible for visitors and parties, where to grab a soda instead of rooting in your main fridge. Beverage Center! My husband constantly wants to take up precious refridgerator space with beer – so that would be a great solution for us. I’ve done several flips myself and clients are always looking for extra storage, so if it’s a choice between the beverage center or a wine fridge, I would say go with the beverage center, because it’ll give the client more flexibility, but if it’s an option to build additional shelving on top of or around the beverage center, that would be ideal, too. Beverage center! My husband and I don’t drink wine and actually a lot of people in our circles don’t drink it either. While it wouldn’t deter us from buying a house, it would be something we would want to change down the road if a house we bought had one. And a beverage center has a lot more uses! I’d say a beverage center, with a few racks for wine! I’d say beverage center for sure. It’s got so many more uses. I like the beverage center, hands down. We don’t drink wine. Beverage center for sure. Some of them come with optional wine inserts too. But even when I want some wine chilling, I want beverages as well. Beverage center is by far more versatile. A friend has one for the kids drinks, beer, wine, and soda all compacted in the tin thing. The only thing I didn’t like was the bottom shelf had a nook in it verses a flat shelf, so flat shelves all across if possible. I think the beverage center is more versatile and could be used for wine if needed – but I’ve also seen combination beverage center/wine fridges at Home Depot – best of both worlds. I agree with some of the comments. While it wouldn’t turn me off from buying a home I loved, I just drink water mostly from the fridge dispenser and there is plenty of room in the fridge for any wine or beer and so I would rather have cabinet space. I’m always short on that. 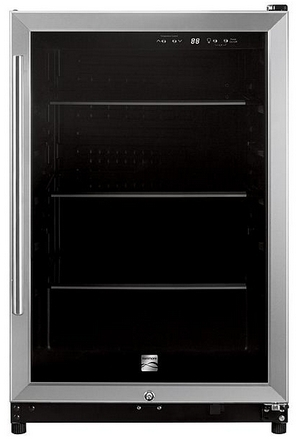 Wine cooler assuming you will have a full size fridge in the kitchen that will hold other beverages. A beverage cooler seems repetitive. Wine is usually stored a different temps that are different than a normal fridge. Beverage center, because I think you could adjust the temperature to fit your wine of choice. I am a red wine girl, and prefer it a little cooler than room temperature. Also, if I were looking at the house to buy, I don’t think I would even notice that it wasn’t a wine cooler since the shape and look are the same. My wine cooler doesn’t hold some of the pinot noir bottles very well, so I prefer the straight shelves. You know I vote wine fridge ;) but maybe that’s just bc it’s what I’d put in my house! I will go with beverage center because you can keep beverage cane as well as wine bottle. I must say that I agree with the majority of the previous comments. The beverage center is far more adjustable and could be set almost whatever you want (it has removable shelves, reversible door and many other changeable options). It has a huge temperature range, which is perfect for all kinds of drinks, not just for the vine. It is designed for the canned and bottled drinks. The great thing is that some models can be installed both as freestanding and built-in appliance.